Today, half of the transplants were, well, transplanted! Into the garden went Chinese cabbage, red cabbage, white cabbage, broccoli, and Brussel sprouts. That was around 230 plants. Back breaking? A little, but I find a glass of red wine (or two) to be quite medicinal. Fingers are crossed that these young plants will like their new digs. 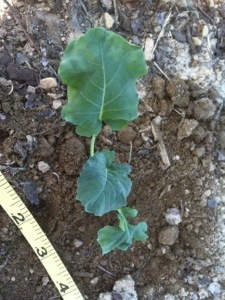 Broccoli seedling transplanted into its new home.